This 1 day program is designed to assist employees who spend most of their time dealing with telephonic customer service or as receptionists in dealing professionally in a telephonic environment. Students will be provided with concepts in effective communication techniques and how to effectively deal with their customer's inquiries and problems via the telephone. Through role-play and structured critique and feedback techniques, participants will learn effective telephone skills and be able to improve their representation of their company with the telephone. "I've taken telephone Skills workshops before, but yours gave me some new ideas!" "Thanks for giving such an entertaining seminar on an old topic!" "Your information was well presented and timely for our organization." Be able to understand the four basic behavioral styles and adapt their behavior style to that of the caller. Know the rules of Telephone etiquette and be able to employ these rules for successful telephone encounters. Be able to take and record telephone messages efficiently and appropriately. 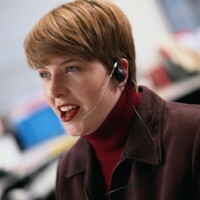 Improve their telephone skills by improving and enhancing their listening skills. Be able to understand what makes a good telephone voice and gain the skills to train their telephone voice. Be able to list and define the three sections of the successful telephone call. Understand and utilize various probing questions to elicit appropriate responses from callers. Understand how to handle complaints and diffuse angry callers. This program can be done in a 1 or 2 day format. A 2 day program is recommended for the greatest impact on your organization. We can do the course at your location or at an off site conference facility. Section 1 - Understanding Both Ends Of The Line! Section 3 -- LISTENTICATION: The Art of Hearing What is Said And Seeing What You Hear! "Make service your first priority, not success and success will follow." "Be everywhere, do everything, and never fail to astonish the customer." "Never underestimate the power of the irate customer."